This is a yummy rich coconut cream pie flavor blend perfectly with a note of whipped cream to complete its great and all-satisfying taste. A sweet and subtle coconut cream pie water soluble flavor, coconut lovers rejoice. 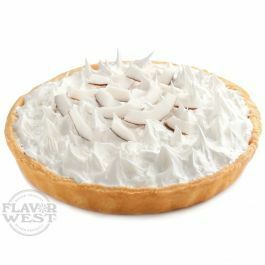 Type: Coconut Cream Pie Water Soluble Flavoring. Ingredients: Natural and Artificial Flavoring, Propylene Glycol. USP Kosher Grade Flavoring. Usage Rate: 15-20% for E-use. Flavor suitability: beverages, desserts, drinks, candies, caramel, baking recipe and more. Specific Gravity: 1.10 No Refunds on Flavoring.